Rub-R-Grip™ full colour countermats are ideal attention getters at the retail level. They are a great selling tool for cosmetics, convenience goods, automotive and electrical supplies, building material, fast food and much more! Following the green concept that “less is more”, Rub-R-Grip™ Counter Mats and Mouse Pads offer an ultra-thin, ultra-cost-effective alternative to the traditional, old-fashioned 1/8” rubber mats. With a tough, scuff-resistant vinyl top and a firm, and a firm, thin rubberized backing, they offer superior resistance to denting and scratching. And they are less likely to catch on the edges of products or on customer’s coat-sleeves – so they stay looking good longer. Our unique automated process laminates the layers together with anti-curl devices, and the materials are all-plastic – no paper fibres. This means your message lies completely flat and is totally moisture resistant. with New Rub-R-Grip™ Window Pads! 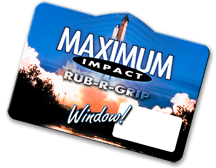 Discover Rub-R-Grip™ Window! 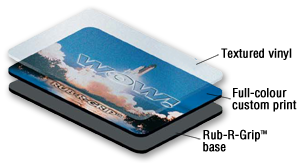 Same great features as regular Rub-R-Grip™, but with a customizable pocket so you can insert a business card or other individualized information to create real personal impact! Click here to check out all our GrovetreeComplete products!